Isn't the cover of this book gorgeous? I'll be honest here and say that it's one of the main reasons why I decided to read and review Down from Cascom Mountain for TLC Book Tours. I was born in the Colorado mountains so I will always have an affinity towards that type of landscape. I also thought it was interesting that Ann Joslin Williams' father was a National Book Award winner so I thought she'd probably be an interesting writer. I was not disapointed. 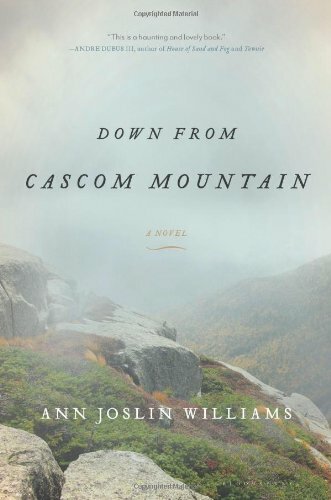 Her writing is beautiful and the setting of Cascom Mountain in New Hampshire just gorgeous. Right here I'll warn you that this book has such a sad center story - Mary's husband falls off Cascom Mountian and dies just days after the couple arrive. Mary's only been with Michael for nine months but her grief is profound. This is one of those situations and stories that scare me a lot because my husband and I go hiking and what if that happened? So yeah, this story is sad and terrifying for me. What made this book a page turner though was the writing. It's definitely a character driven story and Ann Joslin Williams is a beautiful writer. She made Cascom Mountain come alive and the characters were so realistic. While Mary was the main character, the reader also gets to know some of the local kids. Cascom Mountain has a tourist lodge where the local teens work during the summer. Callie was one of the kids and she's written so well. Tobin, a local teen who seems OCD or borderline autistic, helps Mary as she settles into living without her husband. The back of my book has a blurb where it states "this assured debut novel wrestles with grief and desire" and I really couldn't describe this book themes better. Mary spends the summer overcoming her grief and finding how Cascom Mountain can heal. For Callie, at sixteen, this is the summer of her sexual awakening. Bsaically it's a wonderful character driven story set on Cascom Mountain one summer. Beautiful. isit Ann Joslin William’s website at www.annjoslinwilliams.com.